Like several of my priest friends, I decided not to sign the letter circulated by nearly 500 British priests last week. Not that I lack sympathy with those disturbed by this Papacy and the synod, writes Msgr Keith Barltrop in The Catholic Herald. 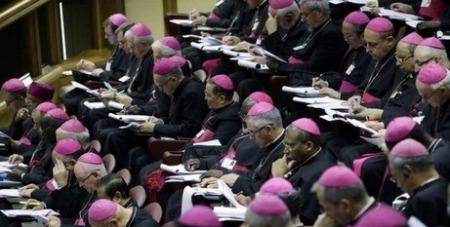 Some of the emotive comments on social media about the recent letter to The Catholic Herald on the upcoming synod included the following: "Deep disturbance” felt by one writer that Cardinal Vincent Nichols pressured priests not to sign the letter; admiration for the “brave priests” who resisted “intimidation by senior churchmen” to pledge their loyalty to Church teaching on marriage; even a suggestion that the signatories will be assigned to “deadbeat parishes” as a punishment. In a world where everyone with a cause seeks to use social media to gain adherents, the Cardinal might have anticipated that priests worried about the synod, and more generally about Pope Francis, would resort to the media. After all, priests, like others drawn to radical movements, often feel rather unempowered, and may excitedly jump on any bandwagon that promises them a taste of real influence. Like several of my priest friends, I decided not to sign the letter. Not that I lack sympathy with those disturbed by this papacy and the synod. In fact that is precisely the point: a priest is surely called to listen attentively and with empathy to all people, both those worried about unfaithfulness to tradition, and those who long for an alternative approach, theologically coherent and pastorally sensitive, to remarried divorcees and gay people. A priest is a bridge-builder (pontifex), an ambassador for Christ (2 Cor 5:20), who died to gather into one the scattered children of God (Jn 11:51-2), not a spokesman for a party. By conveying understanding of those with whom he may not agree, as well as explaining his own convictions, he is able to be a minister of the Incarnate Word rather than a politician. But, of course, politics is always the easier path, as Charles Péguy never tired of saying. These are critical times for the Church.